We are back to school and back to daily school lunches! Although I was somewhat dreading the daily routine, I’m finding that I missed the fun time we have making crazy school lunches. 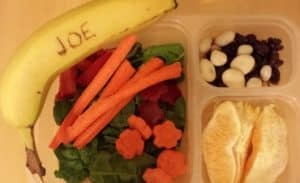 This week we made rice balls, bananas with names, waffle sandwiches, and fruit salad. And remember, we don’t aim for perfection… we aim for fun! These lunches all take less than 10 minutes to make. The first lunch was our favorite frog rice ball. For instructions on making rice balls, go HERE. The eyes are from the cake decorating section of the grocery store, or can be found HERE . The rice mold is THIS bear mold… made to look as a frog. And finally, these Vegetable Cutters were used to make the flower veggies. We just popped the middle out of a carrot slice and stuck it in the cucumber. We added some edamame and peppers and had ourselves a good Bento Box . The next lunch was the banana lunch. I saw the banana sketching idea HERE and was excited to try it. I gave Joe a toothpick and he thought it was great to write a “secret message”. At first the lines are invisible… and the name shows up in a few minutes. 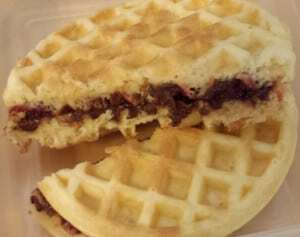 Another lunch was the waffle sandwich. We’ve been big into waffles these days. And by waffles, I mean the kind that go from freezer to toaster and make no real mess in my kitchen. For the lunch box, we made a nutella and jelly sandwich out of a waffle and added some fruits and veggies on the side. And finally, we made a fruit salad lunch. I just threw in strawberries, blueberries, mint leaves and a little Food Pick . 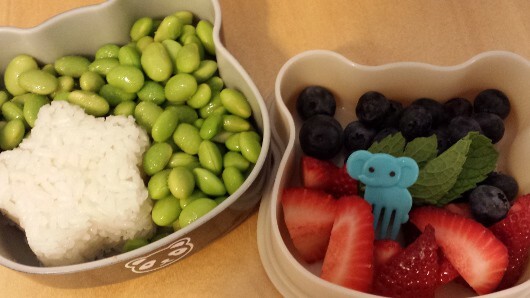 In the other half of the Bento Box , I added a star rice ball and edamame. All in all, it was a good start to the school year. I’m not sure what next week will bring, but I’ll be flipping through Yum-Yum Bento Box: Fresh Recipes for Adorable Lunches for ideas! And finally, in case you haven’t seen it yet, check out this clip from ABC 13 on school lunches! Joe the Garbage Man, 6 Year Old's 1st Business: Interviewed on ABC 13!